Lathan Jones puts the ball up over Fairborn’s Joe Nickel during a Greater Western Ohio Conference crossover game on Friday at Fairborn. 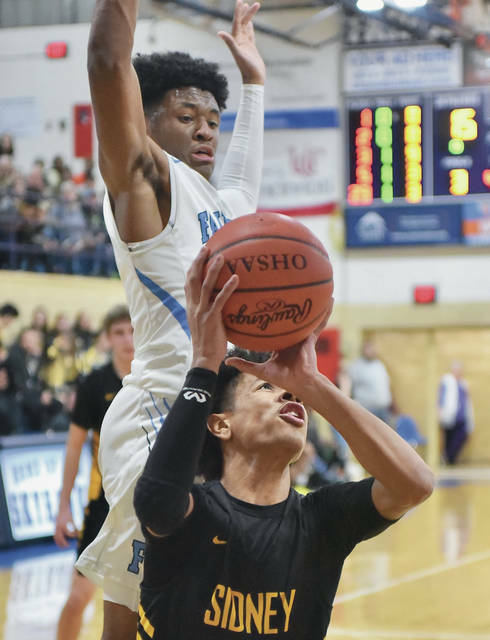 Sidney’s Andre Gordon puts the ball up over Fairborn’s Jarod Bodekor during a Greater Western Ohio Conference crossover game on Friday at Fairborn. Sidney’s Darren Taborn puts the ball up between Fairborn’s Joe Nickel and Jarod Bodekor during a Greater Western Ohio Conference crossover game on Friday at Fairborn. Andre Gordon drives around Fairborn's Shaunn Monroe at Fairborn Friday. Andre Gordon dunks on Fairborn at Fairborn Friday. Sidney's Andre Gordon puts the ball up against Fairborn at Fairborn Friday. 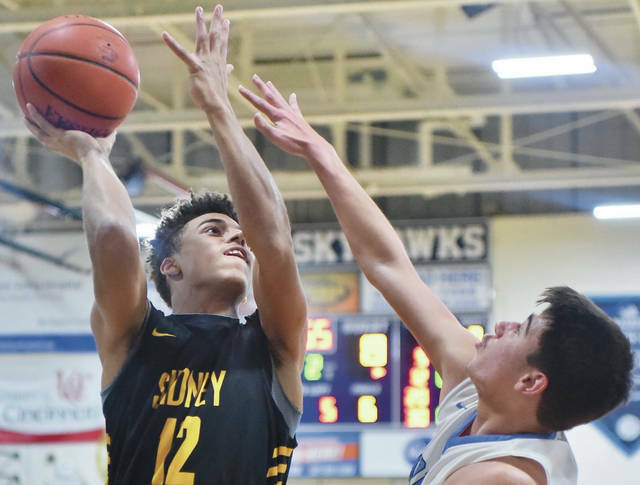 Sidney's Dominick Durr prepares to shoot against Fairborn at Fairborn Friday. Sidney's Darren Taborn puts the ball up as Fairborn's Jarod Bodekor defends at Fairborn Friday. FAIRBORN — It finally caught up to Sidney. 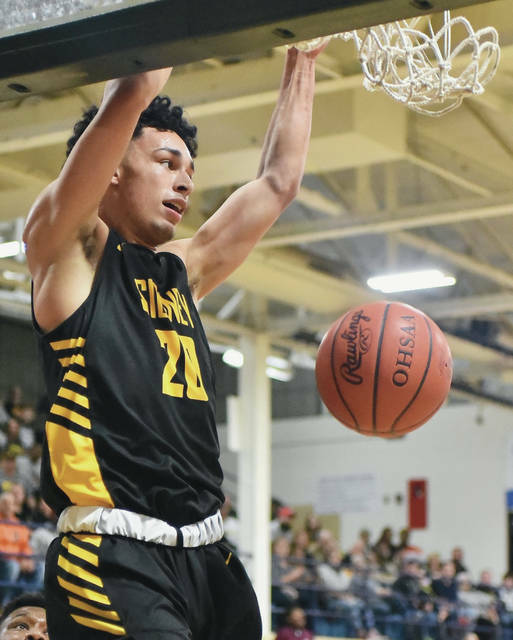 The Yellow Jackets have seen leads disappear before this season but up until a Greater Western Ohio Conference crossover game at Fairborn on Friday had been able to pull it out. Not on Friday. The Skyhawks overcame a 17-point deficit and rallied to beat Sidney 63-61. 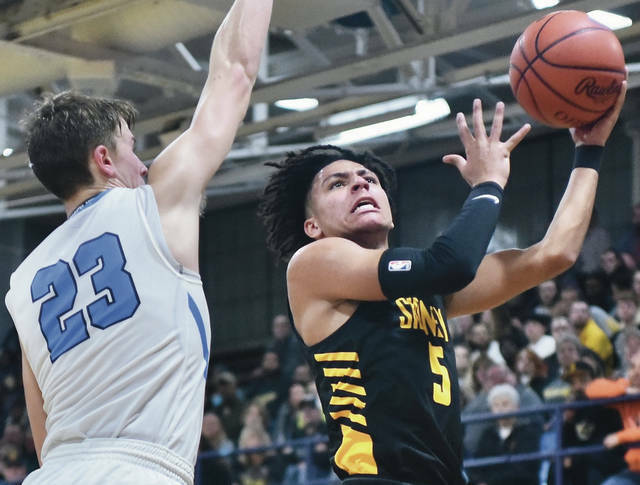 The loss snaps a 10-game losing streak for the Yellow Jackets (10-2, 7-1 GWOC American North), which entered the top 10 in the Division I Associated Press state poll for the first time in school history earlier last week. “It’s a lesson learned here,” Sidney coach John Willoughby said. “Everybody’s messing around. Ratez (Roberts) is rebounding and nobody else is. It’s going to come get you, and it did tonight. Sidney saw a 34-17 lead in the third quarter disappear. The Skyhawks (9-4, 6-1 GWOC South) finished on a 46-27 run, including an 11-1 run in the final 4:15 of the fourth quarter. The Yellow Jackets had a 10-point lead heading into the fourth quarter but fell apart down the stretch. Sidney took an eight-point lead on the 3-pointer by Trey Werntz from the left corner with 4:37 left, but Joe Nickel hit a basket and Jared Bates made a 3 in an 18-second span to bring Fairborn within 60-57 with 3:58 left. Neither team scored for the next three minutes, and they then traded free throws to a 61-58 score with 43 seconds left. Sidney stepped out-of-bounds after a timeout with about 26 seconds left, and Willoughby was called for a technical foul soon after. Shaunn Monroe hit a free throw to cut the gap to 61-59 and was fouled again soon after. He then made 1-of-2 free throws to cut the lead to 61-60 with 13.3 seconds left. After Werntz missed a free throw, Fairborn grabbed the rebound and drove down the court, and Monroe scored on a drive to the hoop with 4.8 seconds left to give Fairborn its first lead since early in the first quarter at 62-61. Roberts fouled Monroe after the shot, and he missed a 1-and-1 free-throw opportunity. The Skyhawks got the rebound, though, and forced Sidney to foul with 1.8 seconds left. 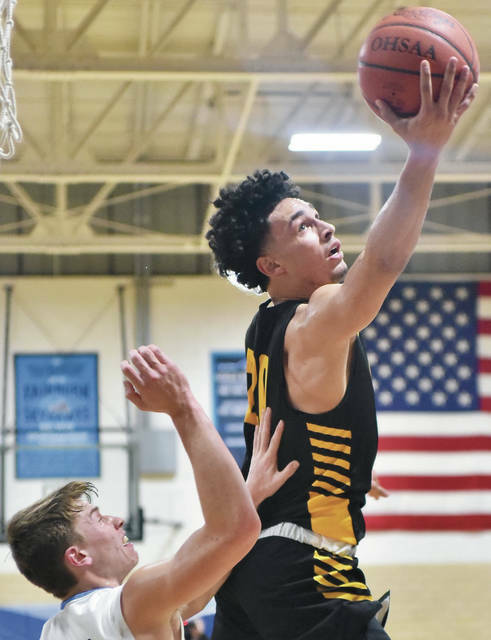 After again making 1-of-2 foul shots, the Yellow Jackets got the ball to Andre Gordon near half court, who missed a heave at the buzzer. “We’ll get up 15 or 17 points, and then we let teams right back in it because we take stupid shots or don’t rebound or something,” Willoughby said. “I don’t understand. We’re up four or five with a minute left, we just have to hold the ball. We don’t even need to shoot it, but we’re in a rush and take bad shots and put our teammates in bad positions. 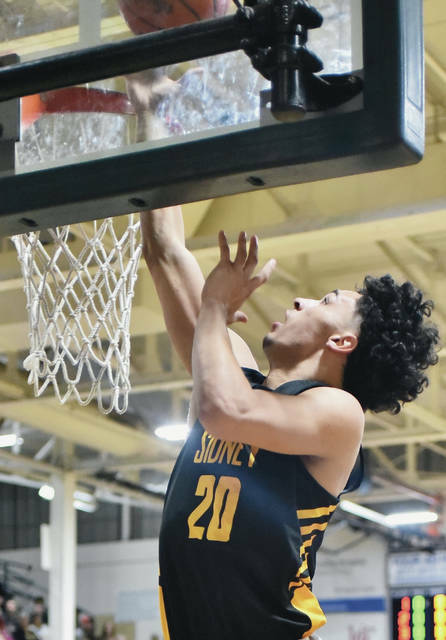 Gordon, a Virginia Tech commit, led Sidney with 18 points. He didn’t score in the fourth quarter. Roberts finished with 12 for the Yellow Jackets. Monroe led Fairborn with 17 points while Nickel and Bodekor each scored 14. Sidney led by 12 points at halftime and scored five points in the first minute of the third to take a 34-17 lead. The Skyhawks finished the quarter on a 13-8 run to cut Sidney’s lead to 10 points, then Otis Person III made a free throw 17 seconds into the fourth to cut the gap to 55-46. 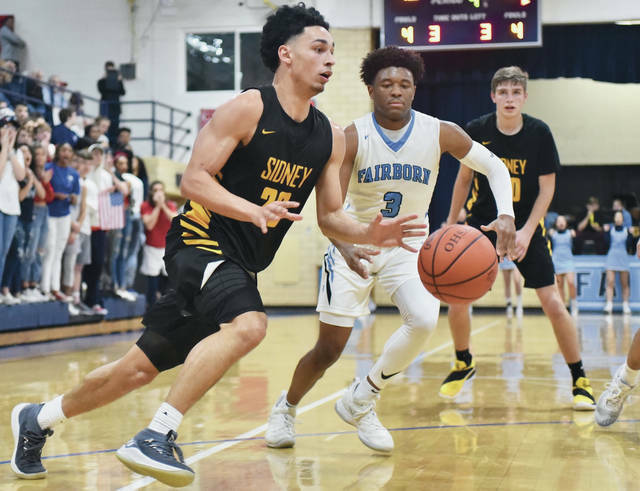 Fairborn shot poorly in the first quarter and Sidney amassed a big lead as a result. After Monroe hit a bank-shot 3 with 6:06 left to put Fairborn up 3-2, the Yellow Jackets scored the next 10 points. Josiah Hudgins made a bank-shot 3 from the top of the key at the end of the first to push Sidney’s lead to 15-5. 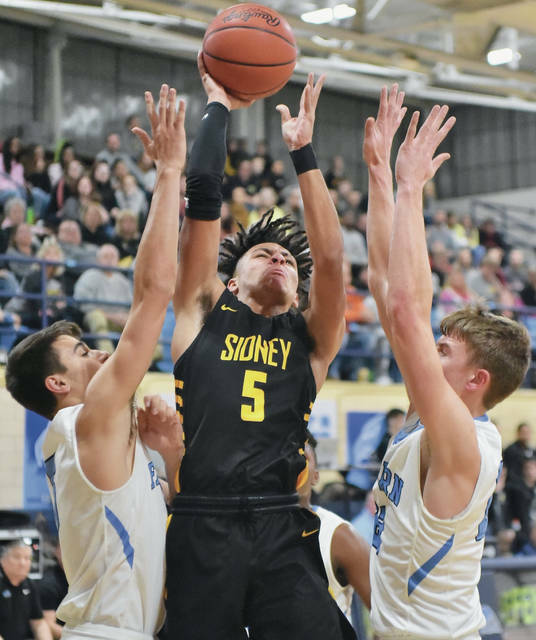 Roberts opened the second quarter with a basket to increase Sidney’s lead to 12 points, but back-to-back three-point plays by Nickel and Jarod Bodekor cut the advantage to 17-11 with 5:56 left. The teams traded baskets until the last 80 seconds of the quarter, when Sidney took control again. Lathan Jones made a three-point play with 1:16 left, then Werntz made a 3 from the right wing with seven seconds left to increase the halftime advantage to 29-17. Sidney will continue GWOC crossover play on Tuesday at Stebbins, which entered a Friday night matchup at Tippecanoe with a 4-10 record. The Yellow Jackets were supposed to host Lehman Catholic on Saturday, but the game has been postponed to Feb. 4. School officials decided on Friday to postpone the contest due to the snowy weather expected to hit the area on Saturday. Andre Gordon drives around Fairborn’s Shaunn Monroe at Fairborn Friday. Sidney’s Andre Gordon puts the ball up against Fairborn at Fairborn Friday. Sidney’s Dominick Durr prepares to shoot against Fairborn at Fairborn Friday. Sidney’s Darren Taborn puts the ball up as Fairborn’s Jarod Bodekor defends at Fairborn Friday. 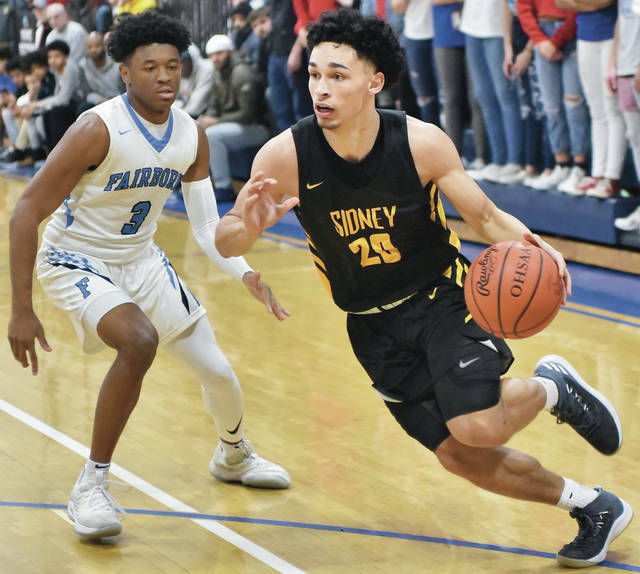 This entry was tagged Andre Gordon, basketball, boys basketball, crossover, Fairborn, Greater Western Ohio Conference, GWOC, GWOC North, image, images, John Willoughby, photo, photos, pics, picture, pictures, Ratez Roberts, result, score, Sidney, Skyhawks, statistics, stats, who won, Yellow Jackets. Bookmark the permalink.